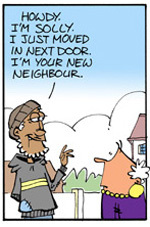 South Africa’s most popular newspaper comic has a new character. This past week, Solly walked into Madam & Eve’s strip - and neighbourhood - opening up a whole world of prospects for stories and gags. Solly is immediately set upon by Mother Anderson, who has taken it upon herself to defend the neighbourhood against the likes of him and the lady who walks the streets selling mielies (corn) at the top of her voice. In fact, it soon turns out that these two scourges of middle class privilege already know one another! Solly’s trolly, filled to the brim with odds and ends (some of which will surprise you), is a prop that will surely prove to be a bottomless resource of material for the strip’s creators Stephen Francis (who writes), and Rico (who draws). 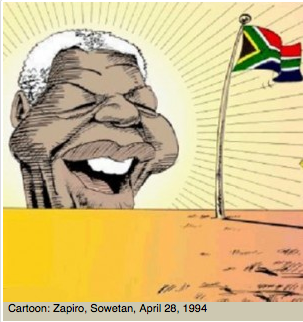 TWENTY YEARS ago South Africa's favourite comic strip made its first appearance in the Weekly Mail. Its purpose was to record the absurdities of a community huddled together on the Southern tip of Africa as it grappled with the most dramatic social change it had ever known. Apartheid was being dismantled around it, and the community's members faced new hope and new challenges. Enter Madam and Eve, a conscientious middle class woman and her wily maid servant; as good a representation of the country's 40 million populace as you'll ever get to fit within the confines of a comic strip frame. Fine artist and satirist Brett Murray, the painter of the controversial portrait of President Zuma titled The Spear, was a special guest of africartoons at the exhibition of Spear Cartoons we curated as part of the co/MIX Day at the Open Book Festival in Cape Town last weekend. Also at the event were africartoonists Brandan, Chip, Deni Brown, Gavin Thomson, Stent and Zapiro, whose work was on display at the exhibition and as part of africartoons' slide presentation of Julius Malema cartoons. Madam & Eve come to Cape Town! MADAM & EVE creators Stephen Francis & Rico were in Cape Town on September 24th for the Open Book Festival to promote their new annual 'The Pothole at the End of the Rainbow'. 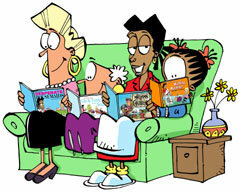 This year's fifth anniversary of the Cape Town Book Fair has some exciting events on offer for cartoon enthusiasts. The fair will be held once again at the Cape Town International Convention Centre, from Saturday 31st July through to Monday 2nd August. Friday, July 30th has been set aside for the trade. 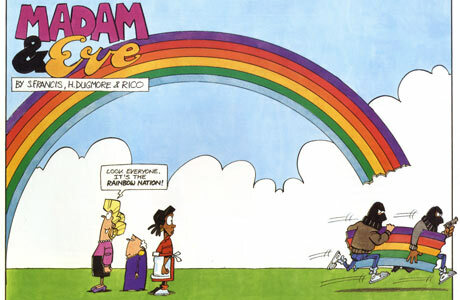 Stephen Francis & Rico Schacherl, creators of “Madam & Eve” have launched a new cartoon strip, aimed at the international market.